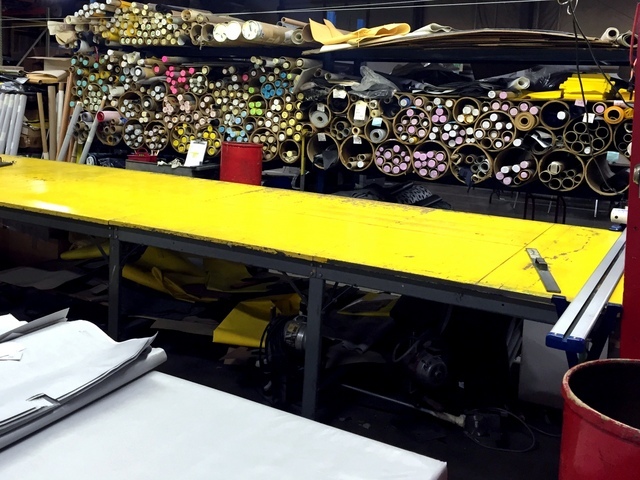 JPC, located in Elkhart, IN, is a family owned and operated contract sewing and fabricating company with a 25 year history of providing top quality products with short lead times. 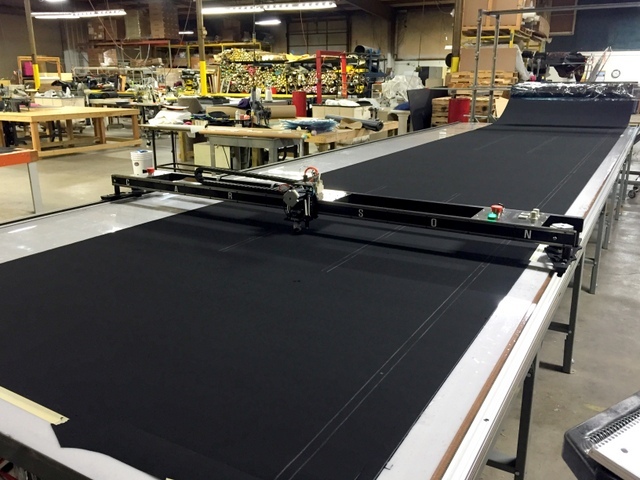 JPC started in 1984 supplying floor mats to the local van conversion industry — now they make truck covers, agricultural equipment covers, recreational vehicle covers and enclosures, custom bags, pads and mats, custom upholstery, and marine canvas. Owner, Greg Haradine, has a special interest in the marine industry — he grew up boating on the many lakes near Elkhart and previously co-owned a boat dealership with his brother. 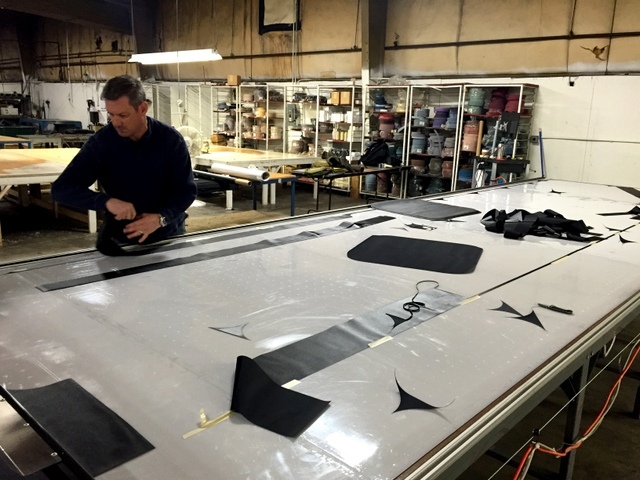 Greg knows the importance of good marine canvas and how hard it can be to fairly charge for your time to making measure, cut, and sew a quality cover. 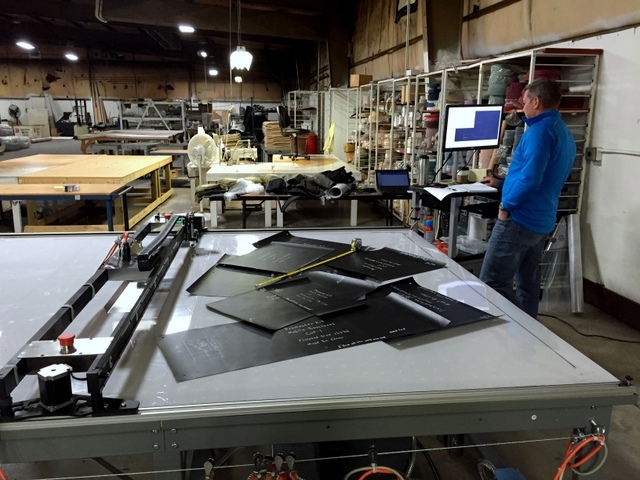 When JPC learned the Carlson Plotter/Cutter and Laser Products 3D Digitizer would allow him to digitize, nest, and plot/cut boat covers, he had a new vision for the future of JPC’s marine canvas department. 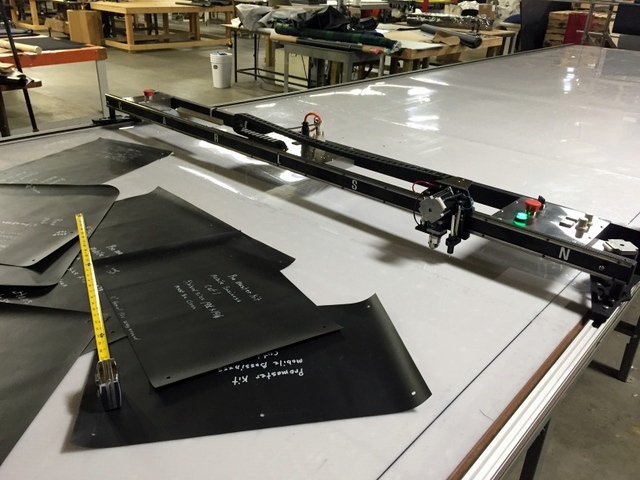 PT-84″ Plotter/Cutter on a 6’x24′ Phillocraft Vacuum Table. Greg’s dream is simple in concept. Get the 3D Digitizing solution from Laser Products to digitally pattern boats. 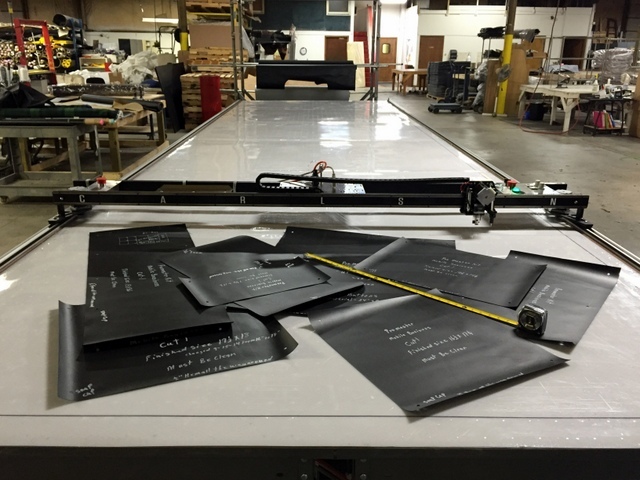 Establish a manufacturing system at JPC to mark and cut those digital patterns with a Carlson Design Plotter/Cutter. Cut high-ply jobs faster than hand cutting. 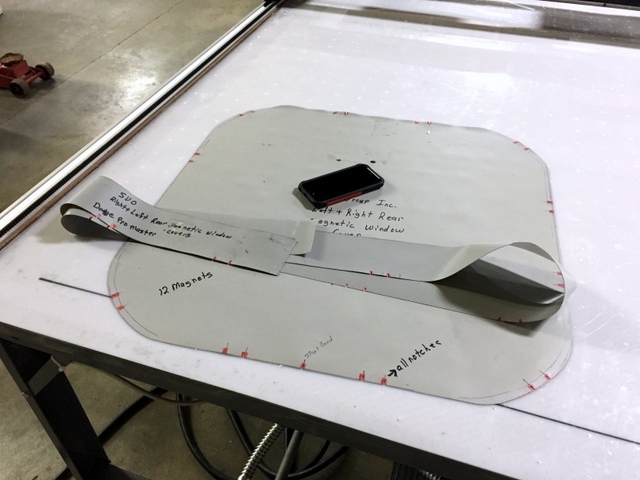 Save time on pattern markers for hard to cut materials. JPC saved days, not hours on our first cuts with the Plotter/Cutter. 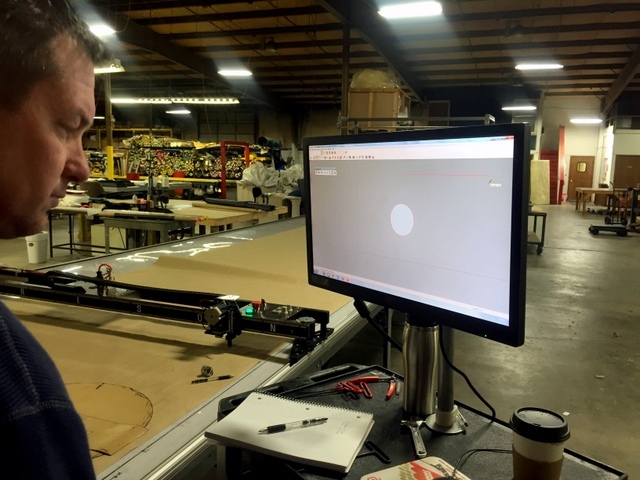 “We purchased the Plotter/Cutter for the marine application only, but I am immediately seeing lots of opportunities to cut our high-ply and other existing jobs. 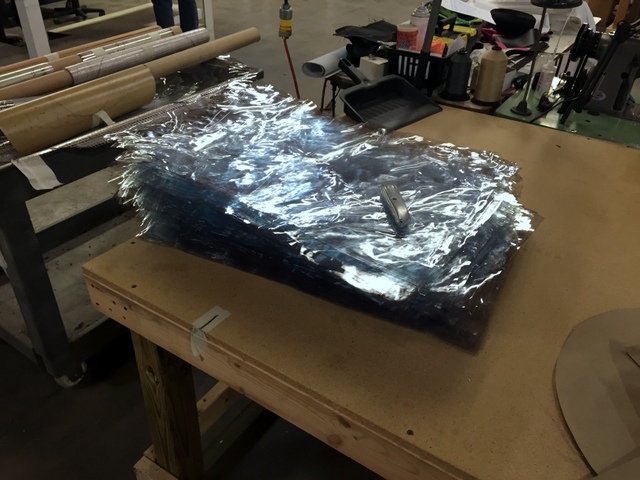 I know the laser is going to take a little time to learn, but I’m blown away by how much time this Plotter/Cutter can save immediately.” And while Greg was right, it did take him a little time to cut his first boat cover, it didn’t take THAT much time. 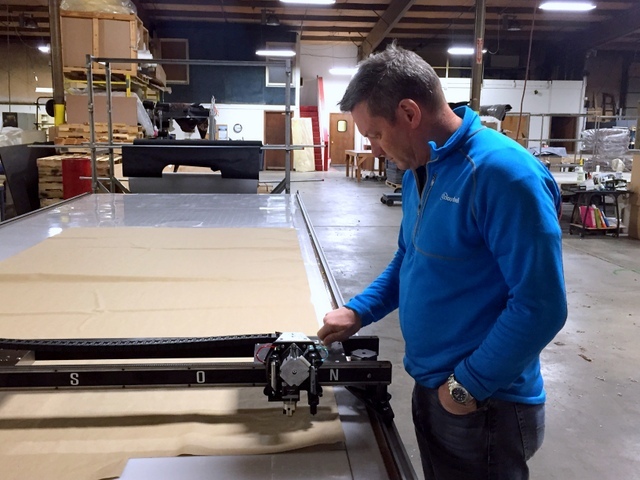 He cut his first cover in less than 3 months after automating – mainly because they were so busy taking advantage of the other unexpected advantages of their new Plotter/Cutter system! Automating isn’t about solving every patterning, marking, and cutting problem on the first day. Most custom canvas shop owners wear many hats. They’ve spent years teaching themselves to pattern, cut, sew, bill collect, be the accountant, the marketer, head of hiring and firing, and even make coffee! Learning how to digitize and automatically plot/cut a marine cover is no different — it starts with the first job. 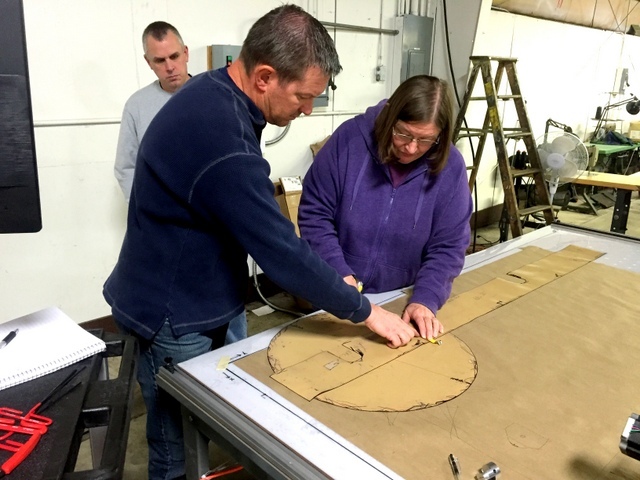 After purchasing the Carlson Design Plotter/Cutter and 3D Laser Digitizer Greg took the following steps to get started. 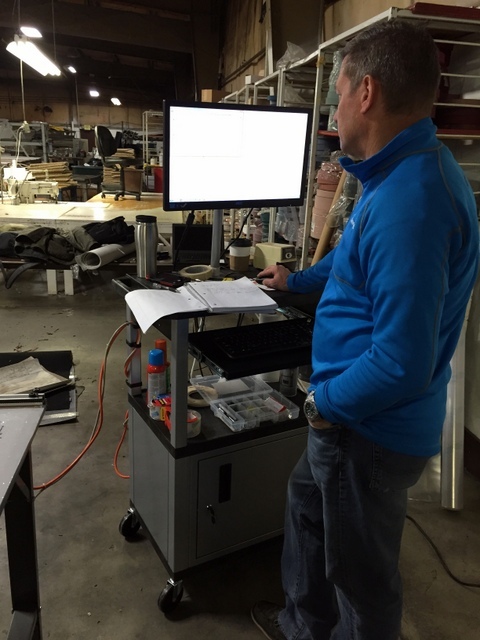 Greg heads to Chicago for a two day 3D Digitizer training session at Laser Products. Carlson comes to Elkhart to installs the Plotter/Cutter — we select “first jobs” to plot/cut so the system can starts paying for itself Day 1. JPC continuously learns CAD basics using the Carlson Design simple CAD toolbar in Sketchup. JPC selects a “first job” to 3D Digitize. 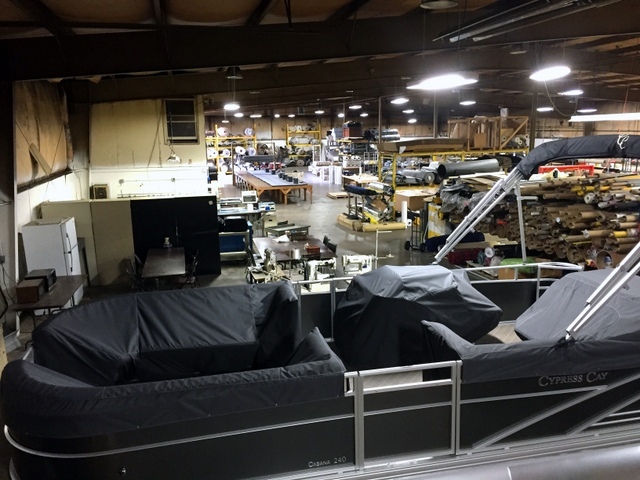 They pattern, cut, and sew a Pontoon boat cover. Keep going! Digitize 3-5 boats until comfortable. Enjoy saving time, money, material, and increasing opportunity. 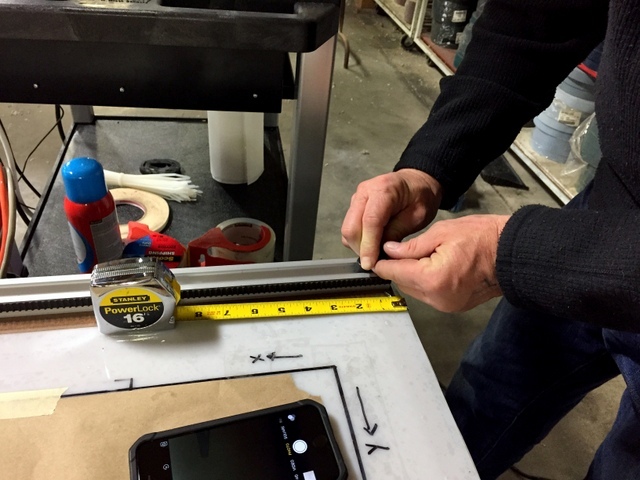 For the first job we started simple, cutting rectangles out of .030″ thick urethane to make covers for the electronics pad on a fertilizer spreader. 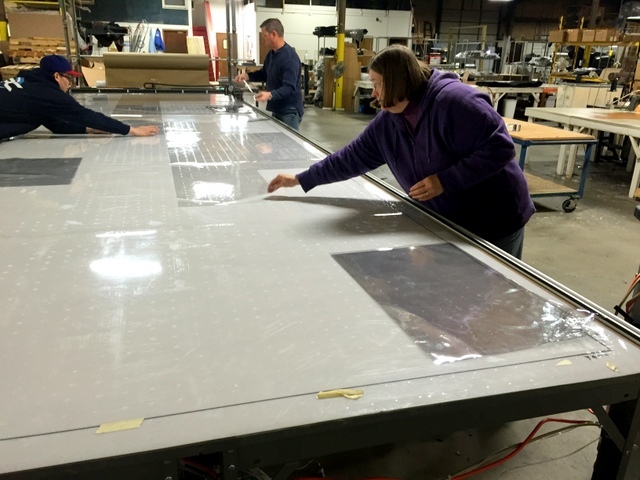 The rectangles were generated using our integrated rectangle maker — easily making the 17″x28″ rectangles nested to fill their table, three wide by nine rectangles long. Urethane is hard to cut by hand — it’s sticky and can only be cut one layer at a time, which is why cutting 100 parts takes an entire 8 hour day by hand. That’s not the case with the Carlson Plotter/Cutter — We cut 27 pieces in 1 minute and 23 seconds and 200 in less than an hour. This Plotter/Cutter just saved 15 hours, eliminated all waste, improved cut quality, and freed up their best person to do ANYTHING else. And that’s just our first cut. This stack cut less than two minutes to cut on the Plotter/Cutter. It would have taken their best cutter two hours or more to cut by hand. 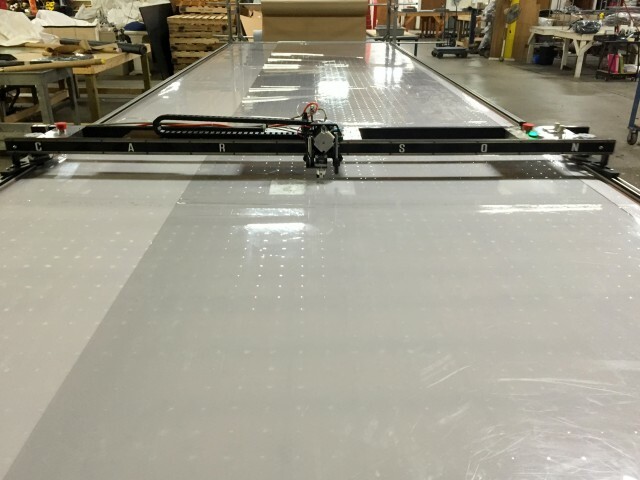 Glamour Shot — the Plotter/Cutter is cutting the .030″ Urethane at 30 inches per second. Everyone was excited to pick parts. Perfect cuts, every time! The “learning CAD” challenge mentioned earlier refers to Greg wanting to become more familiar with Rhino and Mpanel — the two CAD programs used in conjunction to unfold the 3D Digitized patterns. Learning Rhino CAD isn’t difficult but, like any new skill it takes practice. We think the best way to familiarize yourself with the world of Computer Aided Drawing (CAD) is to start Sketchup and our free Carlson Plugin. Sketchup is free, easy to learn CAD program that has thousands of training videos and tutorials, and is fun to use! Oh, and did we say free? Regularly used by architects and building planners, Sketchup makes drawing squares, circles, and basic arcs very intuitive. Almost all of the skills learned to operate Sketchup are applicable in Rhino — we find the simplicity of Sketchup makes it less daunting to get started. 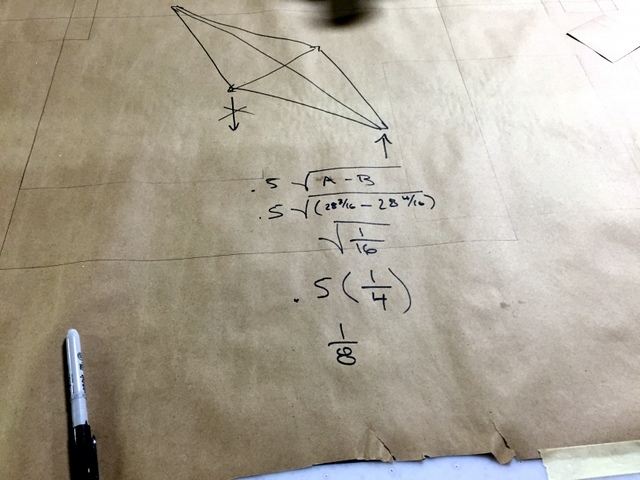 That’s how Greg was able to start drawing his existing pattern library without any prior CAD or Sketchup experience. He enjoyed it so much he took patterns home the first night of training keep drawing on his own. They have a large existing pattern library. Many of those tubes are filled with jobs that are quick and easy to draw in Sketchup. Sketchup has built in tools for drawing squares, circles, and arcs. The Carlson tool bar makes drawing plot, cut, and notation marks even easier. Patterns save from sketchup seamlessly to our Plotter/Cutter controller program, Plotmaster. Our free manual nesting helps them maximize their material yield. 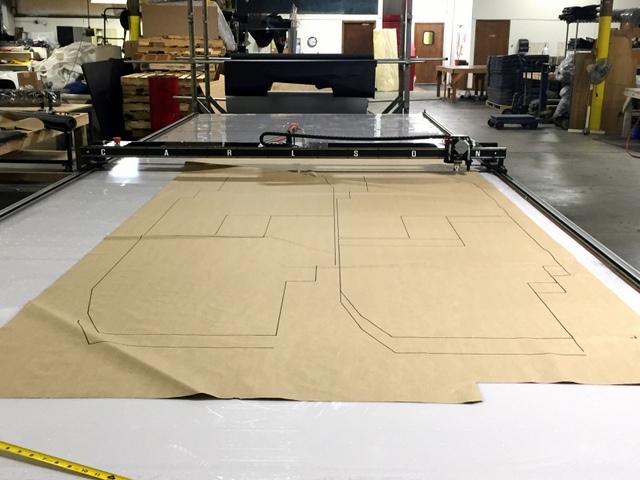 JPC made their first boat cover with their Laser Products 3D Digitizer and Carlson Design Plotter/Cutter system less than three months after their install and training. 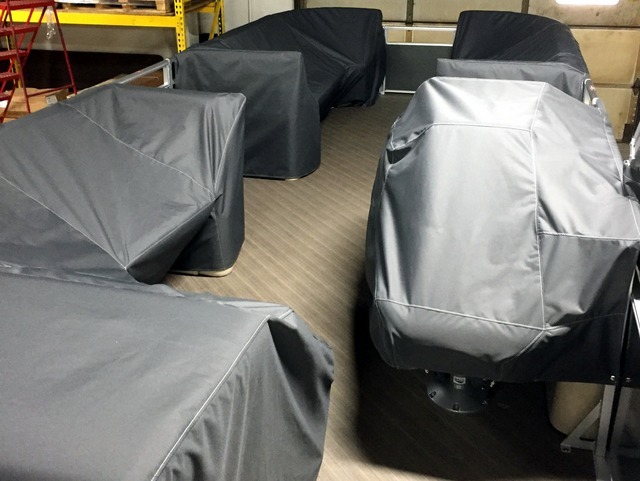 JPC chose a pontoon boat interior for their first project — making sure the customer wasn’t in a hurry, and could leave their boat while they worked on the cover. Greg estimated this first job took about two weeks and, once paneled and sewn, they had one corner that was “about 3″ or 4″ off”. 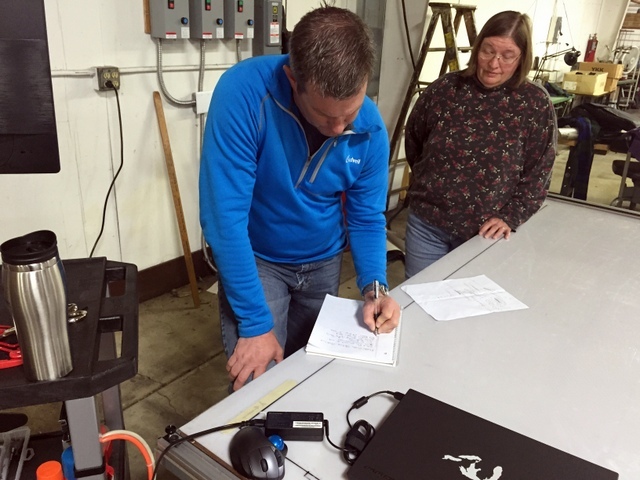 But Greg concluded, “that’s just learning how to measure. I’ll be practicing on a BBQ grill cover for me and my brother. Then an old Ski Nautic. We’ve learned a lot on our first cover. 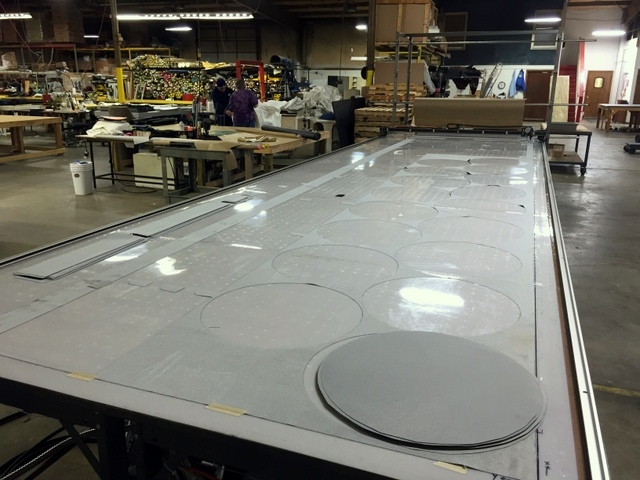 Once we’ve patterned four or five boats we should be able to knock a whole cover out in 24 hours.” Even though it was their first cover using their new Laser/Carlson system, “Our first cover fit a lot better than the one they made at the factory!”. We like our installs to cover a wide variety of projects. 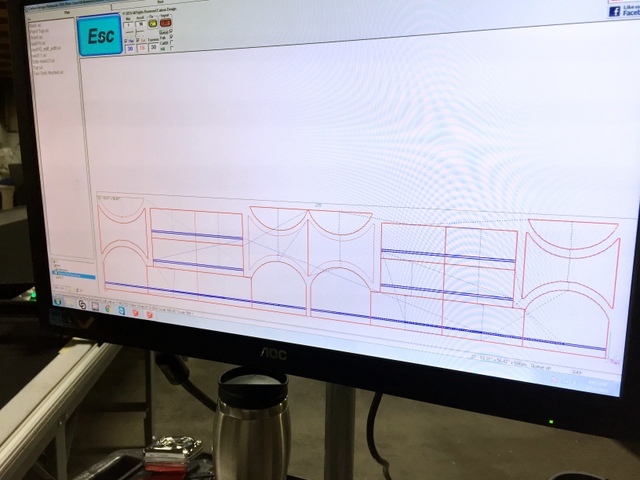 Once JPC discovered how easy it is to draw existing patterns in Sketchup, they started looking for a project to cut our of every material in the shop. Once a job is drawn and nested, it is stored in the computer and can be cut at anytime at the click of a button. This means they have less inventory, shorter lead times, while improving the quality and repeatability of their products. Below we look at several of the projects we cut on the first two days of the install — look at all the opportunity! Plotmaster allows you to save different speed and user settings for different materials. This makes it easy for any operator to cut all of your materials! Drawn in Sketchup, we cut two complete sets with near zero waste out of PVC in less than eight minutes. These take a lot of time to draw by hand — it would be hard to find your physical pattern in the amount of time it took us to finish marking and cutting perfect patterns. They cut covers for an artisan pizza oven by hand — pull patterns, 25 minutes to cut by hand, then each one is marked. We drew the cover parts in Sketchup, nested in Plotmaster, and cut FOUR covers, with marks in 8 minutes and 30 seconds. Now anyone can pull material, select the cover file, and cut a perfect cover. Bev reads off dimensions to Greg while he draws the cover in Sketchup. Nesting parts saves time and material. It takes three minutes to cut one cover, but less than nine minutes to cut four. The Acrylic is marked with a soap stone. The soap stone is hard enough to hold its edge, but still easily erasable. Checking their parts. 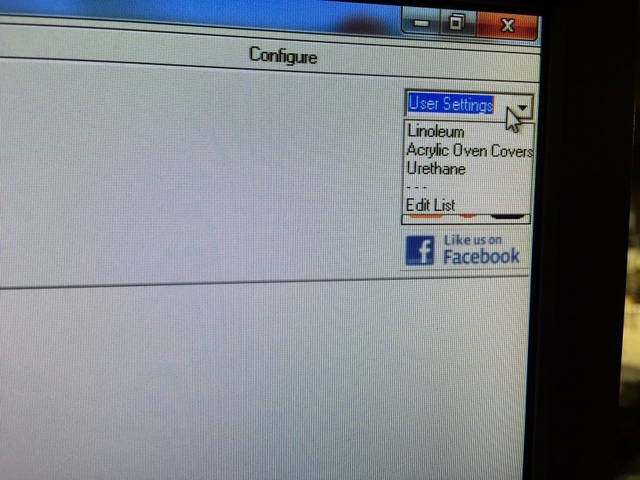 They can now cut a cover at the click of a button. They have several products they produce on a regular basis. 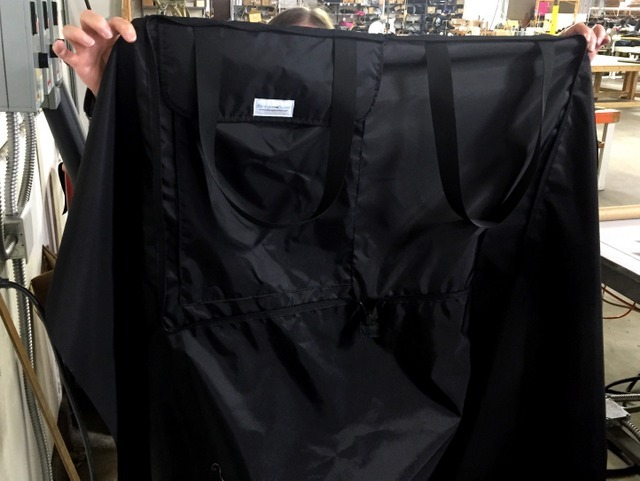 This collapsible picnic blanket is a great example of a complex product made simple by Carlson Design automation. 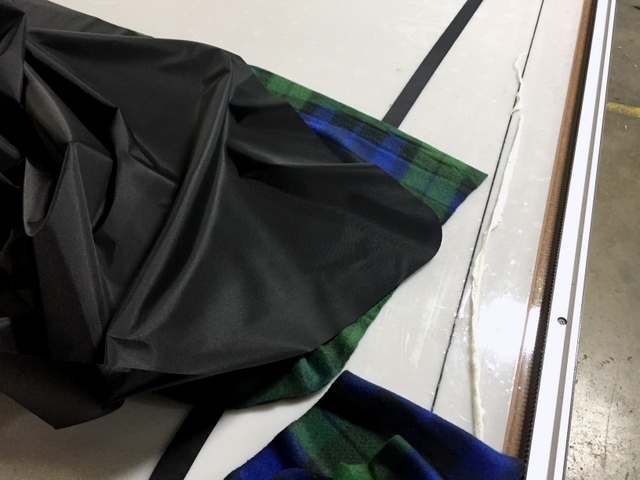 The blankets have multiple parts cut out of multiple materials. 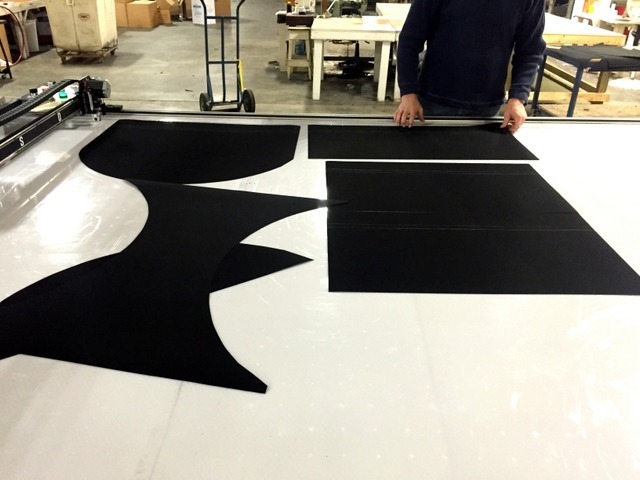 We were able to cut the fleece and 400D nylon together, saving time and ensuring the two are identical in size. We cut a complete set in thee minutes and eight sets in 25 minutes. That’s FAST. 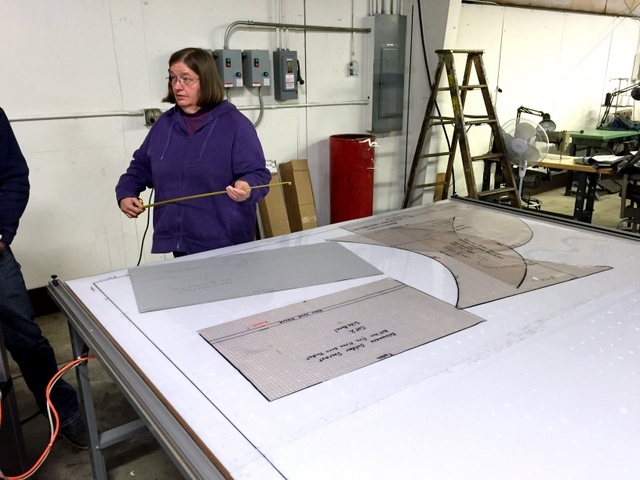 This complex product is marked and cut in three minutes using the Carlson Design Plotter/Cutter. Greg drew their physical pattern set, with notation marks, in Sketchup. Cutting two layers together prevents the fleece from shifting and ensures both parts are identical. Nesting allows them to maximize material yield. They can use their nests to better calculate future fabric orders. JPC started with cutting carpet, so we can’t neglect to examine how the Plotter/Cutter handles cutting heavier materials. 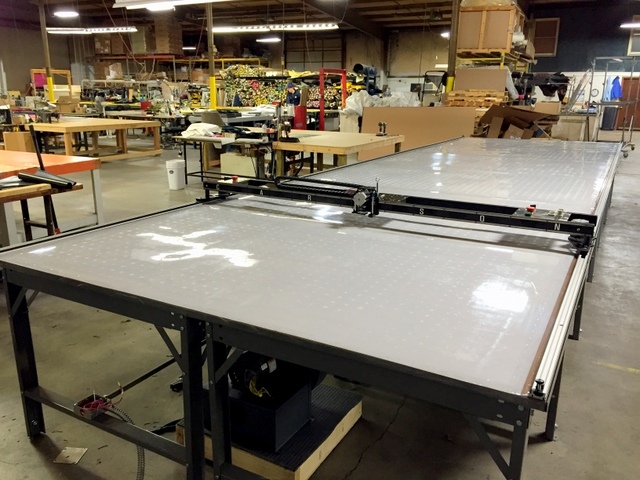 The Plotter/Cutter can cut heavy materials like Linoleum using the carbide drag blade holder. We cut carpet with the steel rotary blade holder by slowing the cut and modifying the cutter lift angle. And for all other materials, including high-ply pattern markers, we can always plot. The Plotter/Cutter can mark on most materials with a pen or Sharpy. Making a pattern marker is a great way to take advantage of nesting. Mark on paper or directly on your material. We hope all of these projects have stirred your creative juices. 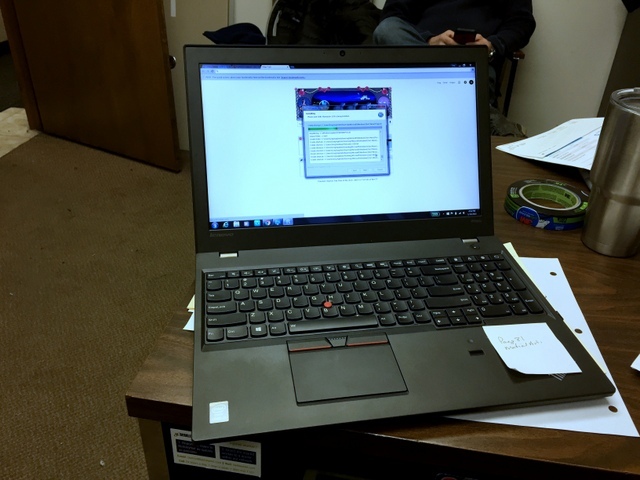 We are excited JPC is automating their simple projects, learning to draw their more complext project, all while working toward “The Dream”. It won’t be long before the dream is their new reality. Here are a few more “Glamour Shots” of a great installation. Thank you Greg and Bev for making our time in Elkhart a great trip – it definitely won’t be our last. During installation, it is very important to take lots of notes! Learning how to square your machine is a valuable skill. Learning WHY to square your machine even more so. If you know the right questions to ask, we can help you get all the answers. Adjusting the track stops to manually square the system is simple and intuitive. Our simple Operator’s Workstation includes a monitor, rolling cart, wireless keyboard tray, and locking storage cabinet. It is an ideal ergonomic workstation for running your Carlson Plotter/Cutter. A design copy of our Plotmaster software suite is installed on multiple computers, allowing Greg to draw, nest, and edit patterns away from the cutting table. 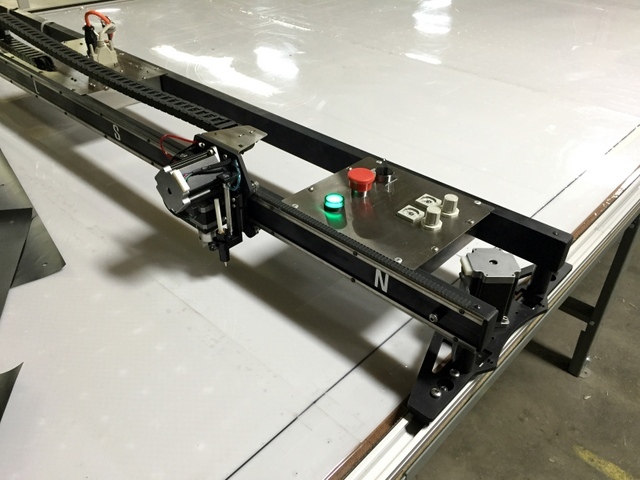 Simple on-board controls make operating the Plotter/Cutter simple. 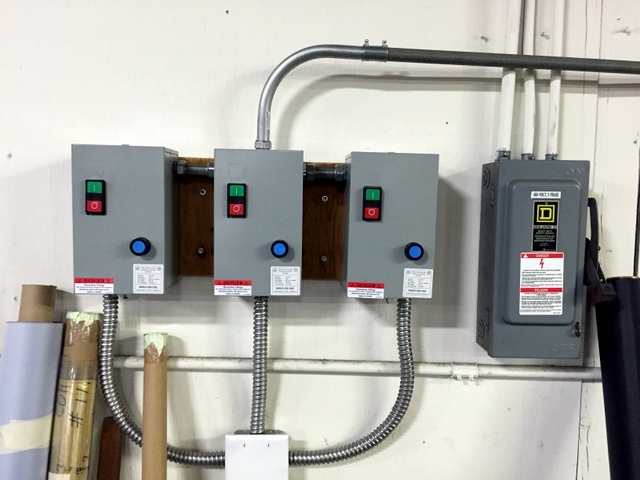 The “Operator’s Panel” includes on/off, emergency stop, and clearly labeled pneumatic regulators for adjusting Plot/Cut pressure. 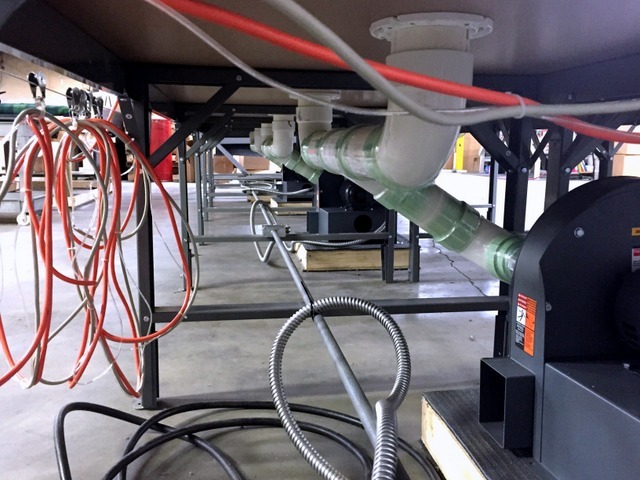 We provided three 3HP radial vacuum blowers for the 7’x24′ Phillocraft vacuum table. These blowers run on single-phase 110/210VAC. Using a local electrician is the best way to ensure your vacuum blowers are wired to code. It is a good idea to place the blower on/off switches or starters near the Operator’s Workstation. 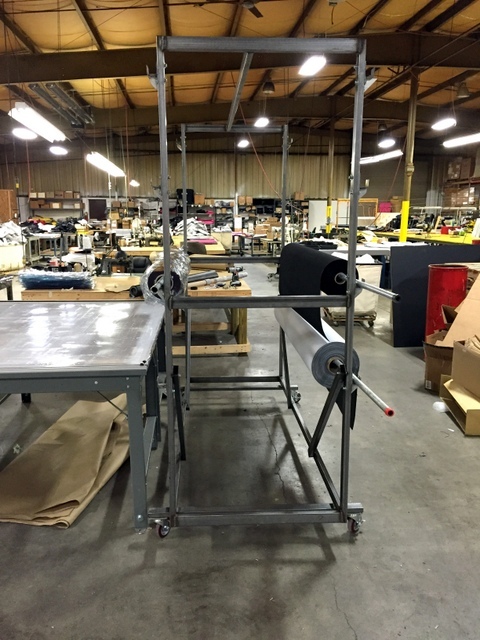 JPC already had an existing fabric roll-rack on wheels. This makes spreading material down the length of their table quick and easy.